The Baker 3 cabinet is an exceptionally beautiful and outstanding unit and also offers plenty of vertical storage to host your cocktail and mocktail events without the mess and provides ease of clearing in no time and moreover a presentable piece of furniture to add to your house. 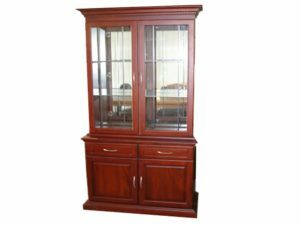 It is multi-functional to be used as a hutch, china, curio, or simply a cabinet. It is made from solid Mahogany timber that will last for many years growing more graceful with age.